We are a thrift store in Grimes, Iowa that supports the work of Many Hands for Haiti. MH4H runs programs in Haiti that equip and empower Haitians for transformation. These programs focus on seven strategic areas; economy, leadership, education, safe homes, medical assistance, agronomy, and spiritual development. We also serve our local community by providing affordable shopping at the thrift store, donating to homeless shelters and providing volunteer and employment opportunities. 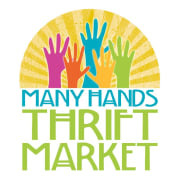 Would you recommend Many Hands Thrift Market?